Motor Oil and Oil Filter changes on on motorcycles is paramount to health of your motor. Harley Davidson oil changes are recommended every 2,500 miles. Check for your motorcycle oil change intervals and let us assist. 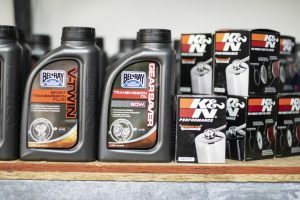 At Olympia Motorcycle Tire’s we carry K&N filters and Bel-Ray product oils. Bel-Ray consistently tests in the top percentile of V-Twin high-quality motor oils (excluding non-foaming racing oils). All oil and fluids drained at Olympia Motorcycle Tire are properly disposed of to meet all EPA and state requirements. On HD models, change motor oil every 2,500 miles. Change oil filter (we carry K&N filters in stock), transmission and primary fluids every 5k miles. On other manufacturers, check your service manual because they may vary. What type of fluids I only use Bel-Ray products. Why do you use who you use for fluids Bel-Ray tests in the top percentile of V-Twin motor oils (excluding non-foaming racing oils) and it doesn’t cost a small fortune. Is there an environmentally friendly message we can talk about through recycling or the oil? All oil and fluids drained at Olympia Motorcycle Tire are properly disposed of to meet all EPA and state requirements. Other points you want to get across If you follow the mileage recommendations listed above, you have taken out the best insurance policy you can give your motor, primary and transmission.